The Samsung Galaxy Tab E Lite 7.0 (SM-T113) 2016 model have been launched in the US with a launch price of $119, which is the lowest tablet price I've ever seen from a Samsung tablet release. Those who want to buy a Samsung Galaxy Tablet to watch movies can consider this Samsung Galaxy Tab E Lite 7.0. Its 7-inch screen with 1024 x 600 resolution display is enough to enjoy videos on it. However, we know that all Samsung Galaxy tablets including Galaxy Tab E Lite 7.0 have limitation of input video formats. They support H.263, H.264(AVC), MPEG4, DivX, XviD, MP4. Your MKV/WMV/AVI/VOB probably can't be imported into Galaxy Tab E Lite 7.0 for some unsupported video formats and codec. 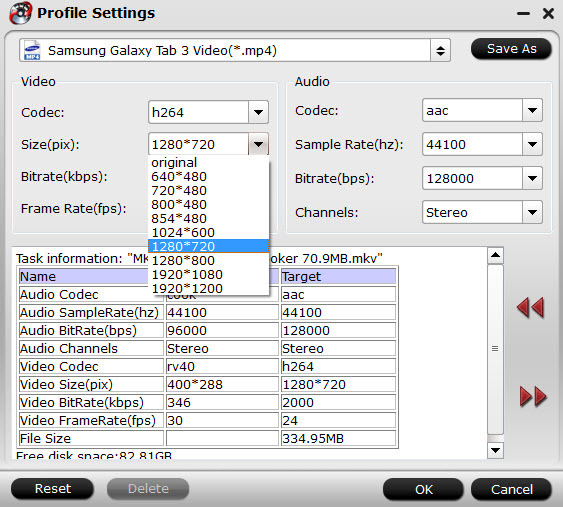 If you want to play MKV/WMV/AVI/VOB on Samsung Galaxy Tab E Lite 7.0, you'd better re-encode these MKV/WMV/AVI/VOB files to Galaxy Tab E Lite 7.0 most compatible H.264 MP4 with AAC audio in 1024 x 600 resolution. To reach the goal, you can use Pavtube Video Converter Ultimate (Mac version to help you. This all-in-one media solution can transcode MKV, ISO, AVI, WMV, MP4, VOB, Tivo, etc to Galaxy Tab E Lite 7.0 playable format video. Actually, it can convert 4K/SD/HD video in any formats and codec to Galaxy Tab E Lite 7.0, Galaxy Tab S, Galaxy Tab A, Galaxy TabPro S, Galaxy Tab S2, Galaxy Note Pro 12.2, etc. For better output video playback effect, you can adjust the output file size as 1024 x 600 to more fit in Galaxy Tab E Lite 7.0 display, or change the output video aspect as 16:9 for watching without pillar box. Besides that, the program also provides some built-in video editing functions for you to trim, merge, crop, apply effect, insert subtitles, etc to personalize and enhance you video. 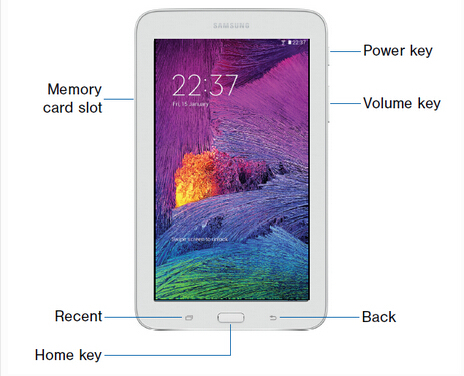 How to watch MKV, AVI, VOB, MPG, WMV, FLV on Galaxy Tab E Lite 7.0? 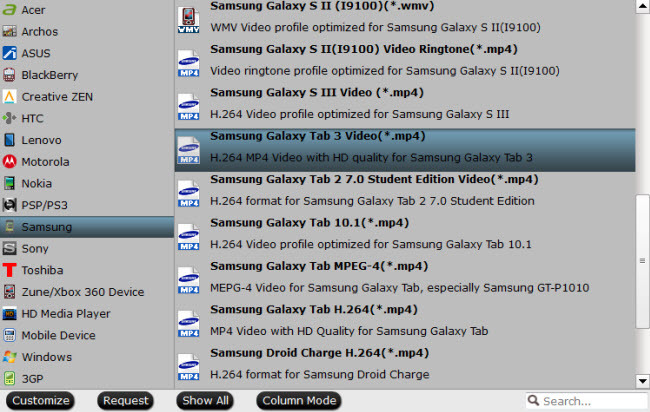 Launch Galaxy Tab E converter on PC and click "File" to follow "Add Video/Audio" or "Add from Folder" to add MKV, AVI, M2TS, VOB, MPG, WMV, or FLV files to it. Batch conversion features allows you to add many files together. Tips: DVD sources or Blu-ray movies can also be brought onto Samsung Galaxy Tab for maximum enjoyment with a specific Samsung Galaxy Tab converter in Pavtube family. Click on the format bar to go to the format list to find "Samsung" option, and then choose "Samsung Galaxy Tab 3 Video (*.mp4)" as output which is also supported by Galaxy Tab E Lite 7.0. Tip: As Samsung Galaxy Tab E Lite 7.0 supports 1024 x 600 resolution, you can change the default settings by going to "Profile Settings" windows to change video size from 1280x720 to 1024 x 600 to match your Galaxy Tab E Lite 7.0. Other parameters like bitrate, frame rate, and channels can also be adjusted just for better entertainment on your device. Go back to the main interface, hit right-bottom "Convert" button to get conversion to MKV, AVI, VOB, MPG, WMV, FLV to MP4 for Samsung Tab E Lite 7.0 view supported file formats. After the conversion process, just transfer the video to Samsung Galaxy Tab E Lite 7.0 with Kies. Then you can play MKV/WMV/AVI/VOB on Samsung Galaxy Tab E Lite 7.0 freely when you are at home or in the travel.